As I mentioned in the last post, the whirlwind of stress actually began with the Abbey litter a couple of weeks before Christmas. One afternoon, when updating photos and videos, I noticed that something was not right with the face of the darkest golden female. I immediately took her to the vet and she was diagnosed with Puppy Strangles. I’ll let you Google this to learn more about it. The symptoms on our little girl were a swollen face, discharge coming from the eyes, and hardness around the lips and mouth. She did not have open sores and we learned that we had actually caught her condition early, thankfully! As we had never even heard of this before, we were quite alarmed. She was immediately given an aggressive treatment of medication twice daily and we kept her and the rest of the litter under a very close watch. While this condition is not contagious, we were on alert with the rest of the litter hoping desperately that this would be an isolated situation that would affect only 1 puppy. Ten days later, a second puppy in the litter (“Draper”, the solid sable male with more white on his face) also developed a swollen face and had very hardened lips around his mouth. I was devastated as Draper had a family (Goldie had not been chosen yet) and was planned to be a Christmas Eve delivery. Having to make that phone call was one of those stomach ache experiences that every breeder dreads going through. Draper and Goldie became partners in treatment, and by this time, Goldie was actually feeling pretty good, but Draper wanted to just relax! The other puppies in the litter seemed fine and while the condition is a serious one if not treated, it is not fatal, rarely comes back, and just required consistent treatment, and we were already seeing major improvement in Goldie. We continued to eagle eye the rest of the puppies in the litter, checking daily for any signs of the same condition, but they all seemed to be clear. Three of the litter mates were matched with forever families and it was soon time for them to travel and get their health certificates. But we did not get good news at the vet visit. While the remaining puppies in the litter did not show any symptoms at all, it was found that their lymph nodes were just beginning to swell. This is the first symptom of Puppy Strangles, so they were not allowed to fly, and all three of them were also put on the aggressive treatment plan for this condition. More phone calls had to be made and this was a very low time that hit us hard over the Christmas holidays. 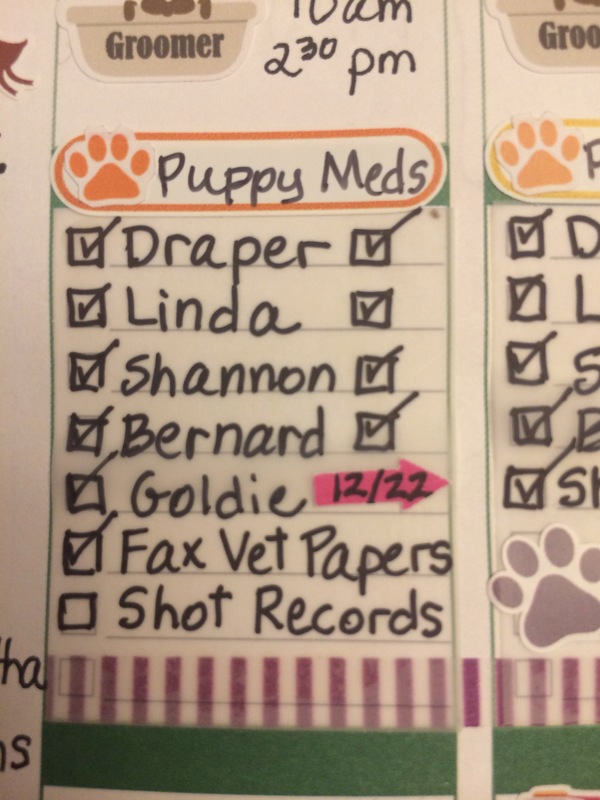 Here is my planner keeping track of all the meds during the peak of having 5 puppies under treatment, multiple vet visits, and everything else that was happening with the dogs–plus it was Christmas week!!! 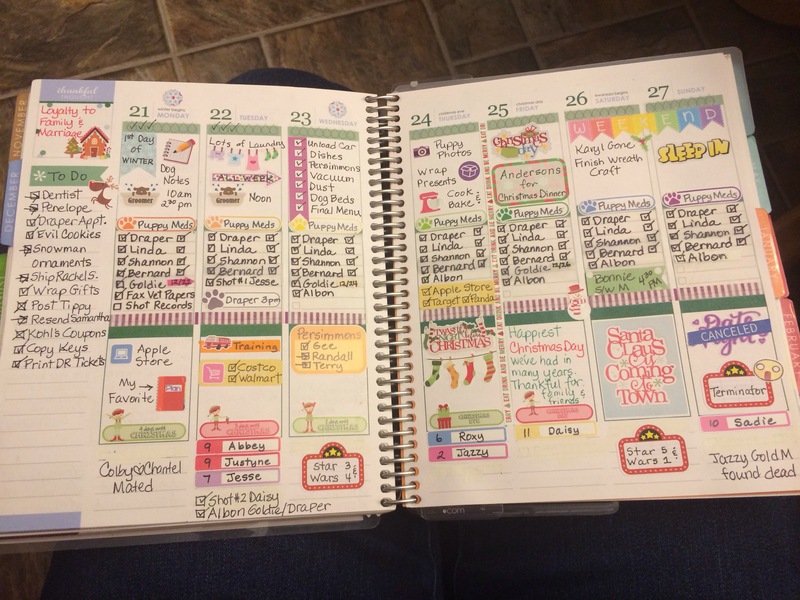 The middle of the column helped me keep track of all the details during this time. As difficult as this experience was, I was extremely thankful for one thing. I was and am SO GLAD this happened BEFORE any of the puppies went home. I can’t imagine the nightmare of 5 families receiving what would have seemed like a perfectly healthy puppy, just to have it develop these very scary and weird symptoms, and have to go through the expense (major) of treating their precious new family member, and the emotional turmoil that would have surrounded that. While there was still some major turmoil and tough decisions made by a few families, I’m so glad that I was the one who could absorb all of this stress and deal with all the details of getting these puppies through this, to a place of healing and good health. I am truly grateful that it all happened with me, and not scattered all over the USA. 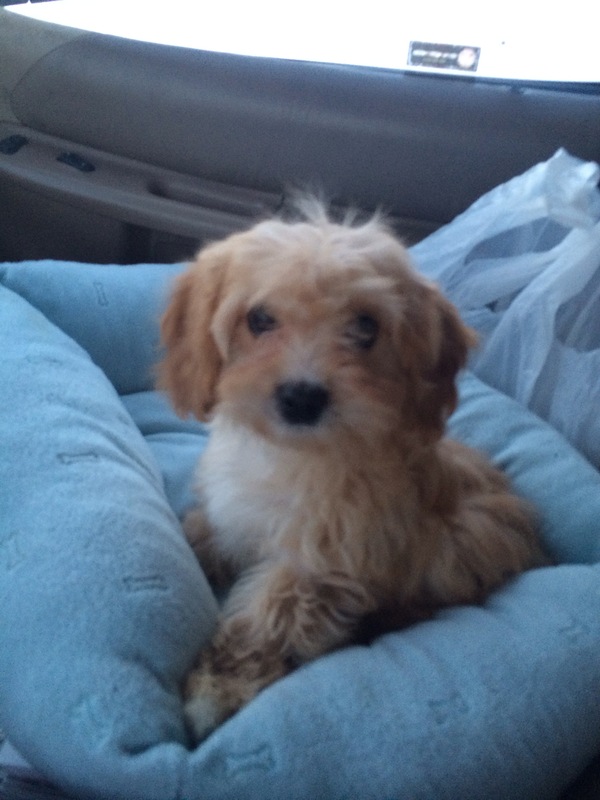 I am happy to report now, that 2 puppies have gone home from the Abbey litter, (Goldie pictured above, the first diagnosed with the condition, and the Blenheim male who never got the condition) and two more (both with only the swollen lymph nodes) are scheduled to leave this coming Friday. We have completed their medication and they will get their final clear bill of health this coming Thursday!! And this brings me to the two available puppies I mentioned on my FB page the other day. Both Draper and the lighter gold female from Abbey’s litter are still looking for forever homes, and both should be ready to travel soon. Draper was the 2nd puppy diagnosed and he did have swelling in his face and lips. The golden girl never developed symptoms. I’m disclosing all of this because I want you to be informed about the medical history of these puppies. In the litter, 5/6 puppies developed Puppy Strangles and we are being careful to not breed the parent dogs together again. Some families decided to still get their chosen puppy in spite of this experience and other families decided to pass. This is a personal decision that each will need to make after doing research and talking with their veterinarians. I just posted a couple of videos of Draper on my Facebook page, Silver Paw Kennels (link in right side column of this blog), and I will try to post some pictures of both Draper and the light golden female here on the blog in the next couple of days. Those on the waiting list have first choice at these puppies, so if you have any interest at all, please contact me ASAP. If you are not on the waiting list, but are also interested in one of these puppies, please send me an email with any questions you might still have. I am not an expert on Puppy Strangles, so please research the condition online, but I can tell you exactly what we went through, how the puppies responded to treatment, and what they are like today. I hope everyone understands my somewhat poor communication during this time. We were pretty swamped over our “vacation” time, not only with quite a few puppies that were ready to go home, but with a “sick” litter, and the two other litters that did not make it. We are hoping everything will get back to normal now, and puppies that will be born later this spring and summer with be healthy and without major complications! So sorry for your hectic time. Praying that all will be well and calm soon. Your puppies are very precious and on my wish list for the future! God Bless. The father of your litter is a different father. Abbey had a previous litter with the current father that had no issues so I’m hopeful we will never see this again. The two puppies that developed symptoms here were not as bad looking as the puppy in the story. They both had similar issues, the swelling around the mouth and the discharge from the eyes, but they did not lose their hair in those areas in spite of having some scabbing that flaked off.